CANELO ALVAREZ TO BATTLE GENNADY ‘GGG’ GOLOVKIN IN HISTORIC REMATCH FOR THE MIDDLEWEIGHT CHAMPIONSHIP OF THE WORLD ON CINCO DE MAYO! LOS ANGELES (Jan. 29, 2018): A sequel to the most anticipated boxing event in years will arrive on Cinco De Mayo as Lineal and Ring Magazine Middleweight World Champion Canelo Alvarez (49-1-2, 34 KOs) and WBC/WBA/IBF/IBO Middleweight World Champion Gennady “GGG” Golovkin (37-0-1, 33 KOs) will clash in a historic and highly anticipated 12-round rematch Saturday, May 5. The event will be produced and distributed live by HBO Pay-Per-View beginning at 8:00 p.m. ET/5:00 p.m. PT. Details regarding venue and tickets will be announced shortly. In September of 2017, Canelo and GGG met in a battle of the world’s two top middleweights, battling toe-to-toe over 12 rounds of high drama that ended in a split draw. The fight drew a record crowd for an indoor boxing event in Las Vegas, selling out the T-Mobile Arena in less than two weeks and bringing legions of fans from Mexico to Kazakhstan and everywhere in between. Alvarez, the 27-year-old native of Guadalajara, Jalisco, Mexico, is the veritable face of boxing. After capturing two world titles and the lineal championship in the super welterweight division, Alvarez moved up to middleweight to capture the WBC, Lineal and Ring Magazine World Titles with a Nov. 2015 victory against Miguel Cotto. Alvarez has maintained his status as the lineal champion ever since, and in a historic Sept. 16 showdown last year, Alvarez fought to a 12-round split draw against Golovkin. 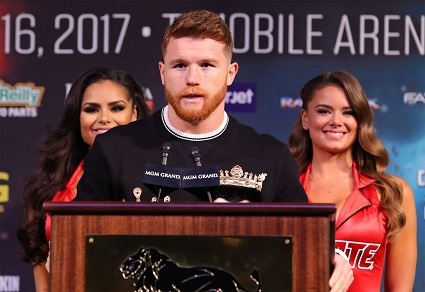 Alvarez is eager to erase all doubts regarding his status as the best middleweight in the world on May 5. Canelo vs. Golovkin 2 is a 12-round fight for the middleweight championship of the world presented by Golden Boy Promotions and GGG Promotions. The event is sponsored by Tecate,”THE OFFICIAL BEER OF BOXING,” Hennessy, “Never Stop, Never Settle,” Fred Loyal Insurance, Tsesnabank and Capital Holdings. The event will take place Saturday, May 5 and will be produced and distributed live by HBO Pay-Per-View beginning at 8:00 p.m. ET/5:00 p.m. PT. 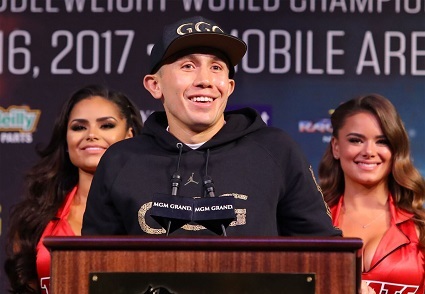 1 Response to "CANELO ALVAREZ TO BATTLE GENNADY ‘GGG’ GOLOVKIN IN HISTORIC REMATCH FOR THE MIDDLEWEIGHT CHAMPIONSHIP OF THE WORLD ON CINCO DE MAYO!" GGG won the first fight, he got robbed. Now i wonder if it wont happen again.